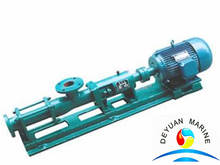 Our marine screw pump mainly include single-screw pump and twin-screw pump with capacity from 3-2000M3/h.Available pump body material is cast-steel,cast-iron,cast stainless steel with cast steel,or cast stainless steel,ordinary steel screw. 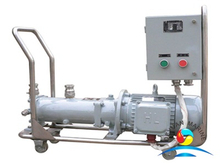 For single-screw pump,it is in horizontal structure,driven by marine motor,used to deliver sewage,fuel,and lubricating oil,this single screw can equipped with a trolley,electrical startup box,cable,fast connector etc,then it can work as a portable pump. For twin-screw pump,it is widely used in oilfield,ship building industry,transportation and storage of petroleum products,petrochemical industry,thermal power plant etc,mainly used to transfer variety of oil,sewage,sump oil,polymer,crude oil etc,twin screw pump also can service as marine cargo oil pump,sweeping cabin pump,marine ballast pump,lubricating oil pump,loading pump etc. 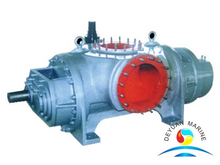 If our marine screw pump meet yr demands,pls donot hesitate to contact our sales team for further discussion.